Need a Free Motorcycle Bill of Sale? This Free Motorcycle Bill of Sale may be used for the transferring of title (ownership) of either a new or used motorcycle. You also need to check with your local authorities for any other specific ownership documentation needed as well as the obligations of both seller and buyer when doing a private motorcycle transaction. Many of the official government sites also supply legal documents such as a bill of sale, lien release etc. However! It's important to note that the typical bill of sale published on the government sites is drafted towards making your declaration as to the selling price (upon which taxes or other fees will be charged) and may not spell out the terms and agreements between seller and buyer. 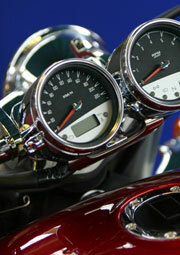 Our free motorcycle bill of sale on this page provides those additional terms. As with any legal agreement, any changes and all pages must be initialed by both parties with full signatures on the last page. All addresses listed on this agreement must be complete physical addresses (not postal boxes. Note: The motorcycle sales agreement on this page is for a single payment with an optional clause if a holding deposit will be paid. Motorcycle Installment Sale - for use with multiple payments. Lien Release - to be issued by the seller where applicable. Motorcycle Power of Attorney - where an agent is acting on your behalf. 3.1 The Seller guarantees that he/she is the true and lawful owner of the above-described motorcycle and that it is free of all encumbrances and any and all legal claims. 3.2 The Seller warrants that at the date of signature of this agreement there are no licensing fees or fines or other penalties outstanding against the registration of the motorcycle sold in terms of this agreement. 4.1 The motorcycle is sold "As-Is" and the seller shall not be liable for any defects, patent, latent or otherwise. 4.2 The Buyer admits having inspected the motorcycle to his/her satisfaction and that no guarantees or warranties of any nature were expressed or implied by the Seller or his/her agent regarding its condition or quality. The Buyer is of legal age and legally competent to enter into this agreement. 6.1 The Parties agree to sign all documents necessary to transfer ownership of the motorcycle from the Seller onto the name of the Buyer within 7 (SEVEN) days of signing this agreement of sale. 6.2 The Buyer shall be liable for all costs relating to the registration of the motorcycle into his/her name and all costs relating to the Roadworthy Certificate. 7.3 Ownership of the motorcycle will only pass onto the Buyer once the bank honors the check or other legal instrument of payment. The Risk passes to the Buyer once the Buyer or his/her agent receives the keys to the motorcycle or takes possession of the motorcycle. Note: As the seller of a motorcycle you may find a buyer who wants to pay a deposit to secure the sale, with the balance to be paid later. In that case, you can add the following clause to your free motorcycle bill of sale. 10.1 The Seller acknowledges that a holding deposit in the sum of _____________ was received on _____________20____. 10.2 The Buyer agrees that the balance of the Purchase price in the sum of ________________ must be paid by ______________20____. 10.3 The Parties agree that the Holding Deposit is non-refundable. They further agree that should the balance of the Purchase price not be paid by the date as in 10.2 above, the Buyer will have no further claims to the motorcycle described in 2. and the Seller is relieved of all obligations in respect of this agreement. Got your free motorcycle bill of sale signed and witnessed? Go ahead and share a toast on a successful private sale!